By the time Franklin D. Roosevelt won his first reelection in 1936, he had already done a great deal for his country, including the rolling out his second wave of New Deal programs, including the WPA, the SSA, the NYA, and the RA. But hailed by some as FDR’s crowning achievement was his fulfillment of one particular campaign promise: the repeal of the eighteenth amendment—prohibition. Less than a year into his first term, on December 5, 1933, Roosevelt signed the twenty-first amendment into law, thus putting an end to the thirteen years dry years that had loomed over America’s head as it drank itself into a stupor like never seen before, and the whole nation celebrated with a round of beer. The “Dixie Songbird” Bill Cox brought us the “N. R. A. Blues” in 1933, in celebration of the recently elected Franklin D. Roosevelt’s first New Deal. Come FDR’s reelection three years later, Cox—ever the loyal Democrat—wasn’t about to let the occasion pass without a song. This time around, he was joined by Cliff Hobbs, a young man whom Cox had earlier hired to accompany him on guitar after being temporarily incapacitated by a hand injury, and later joined him permanently as a singing partner at the suggestion of record producer Art Satherley. Ultimately, the tribute that the two created turned out to be one of the most charming and enduring of the Depression-era topical songs. Melotone 7-02-61 was recorded in New York, New York on November 28, 1936, less than a month after the election of ’36 that saw FDR’s reelection, and represents the entirety of Cox and Hobbs’ session that day. Both Cox and Hobbs sing and play guitars; Cox doubles on harmonica on a rack. It was also issued on Conqueror 8771 and later on Okeh 05896. 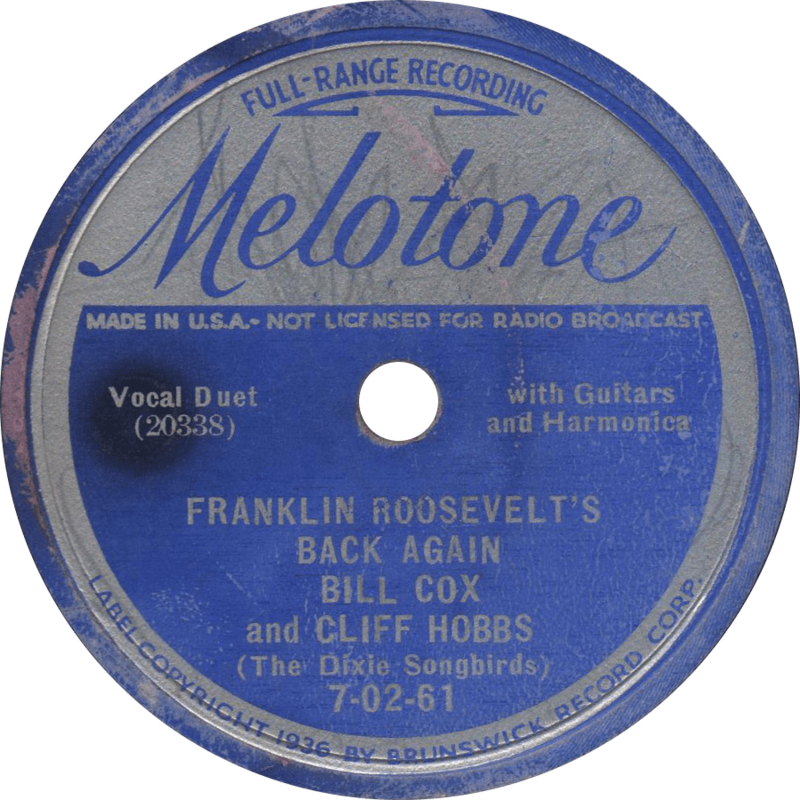 Franklin Roosevelt’s Back Again, recorded November 28, 1936 by Bill Cox and Cliff Hobbs (The Dixie Songbirds). 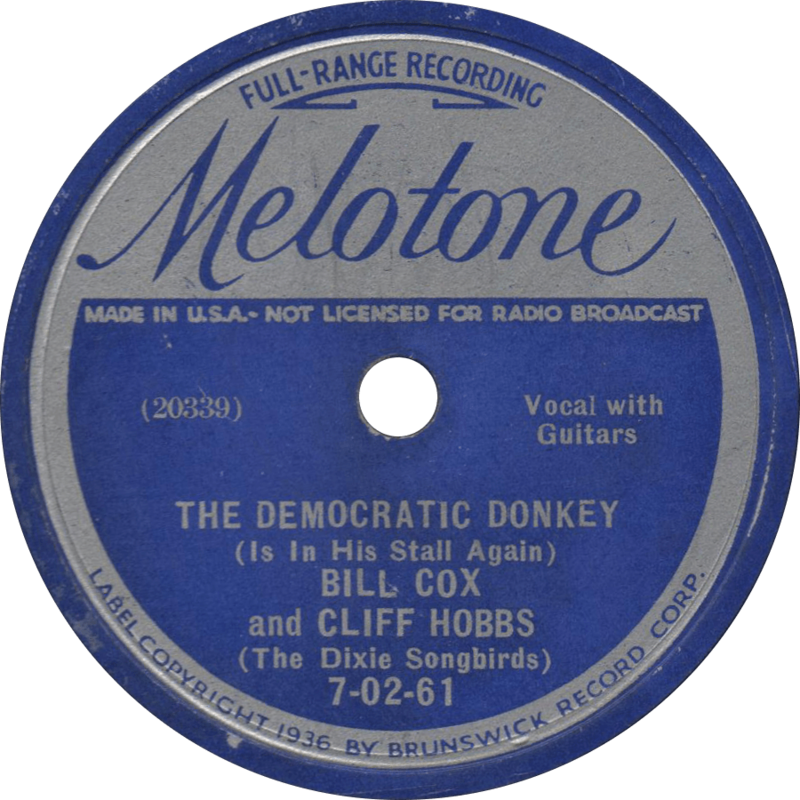 The Democratic Donkey (Is in His Stall Again), recorded November 28, 1936 by Bill Cox and Cliff Hobbs (The Dixie Songbirds). This entry was posted in Records and tagged 1930s, ARC, Bill Cox, Cliff Hobbs, Folk, Great Depression, Hillbilly, Melotone by R. Connor Montgomery. Bookmark the permalink.